Reasonable Accommodations: People with disabilities who require accommodations to participate in FSA programs should contact the County Executive Director in the FSA Office in your area or Federal Relay Service at 1-800-877-8339. Alternatively, you may also contact Colorado FSA Civil Rights Coordinator Jenny Peterson at 720-544-2895 or jenny.peterson@co.usda.gov. As we move our clocks forward and approach spring, the days become a little longer and producers are busy with planting preparations. We hope you take some time to review the FSA Newsletter, and take note of any approaching dates and deadlines applicable to your farming or ranching operation. FSA customers not only have the option of receiving agency updates via email, they now also have the option to subscribe to receive FSA text message alerts on their cell phones. These alerts provide time-sensitive information. Contact your local FSA office to learn how to subscribe to FSA text message alerts. Thank you to everyone who participated in our 2017 County Committee elections. Your local committees are hard at work completing orientation training. Thanks as well to those who participated in the nomination and election periods by either running for office or voting. We look forward to working with each of you. U. S. Secretary of Agriculture Sonny Perdue announced Farm Service Agency (FSA) State Committee appointees earlier this year. 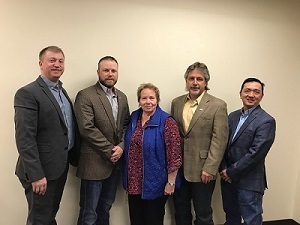 The State Committee is responsible for the oversight of farm programs and county committee operations, resolving appeals from the agriculture community, and helping to keep producers informed about FSA programs. Producers who have wind turbines constructed on their farms should notify the local Farm Service Agency office. Any area that is no longer considered suitable as cropland (producing annual or perennial crops) should be designated in FSA’s records and aerial photography maps. When base acres on a farm are converted to a non-agricultural commercial or industrial use, the total base acres on the farm must be reduced accordingly. Non-cropland areas used for wind turbines might impact payments calculated using base acres, such as Agriculture Risk Coverage (ARC) and Price Loss Coverage (PLC). In certain situations, landowners and operators may need to graze a field containing Conservation Reserve Program (CRP) continuous practices such as grass waterways (CP8A), contour grass strips (CP15A); filter strips (CP21); quail and upland bird habitat buffers (CP33), denitrifying bioreactor on filter strips (CP21B), or saturated filter strips (CP21S). FSA must first authorize the incidental grazing on CRP in a field intended to be gleaned. Grazing is incidental to the gleaning of the crop residue in a field, or before the harvest of a small grain and occurs after the harvest of crops from within the surrounding field, or during the dormant period of a small grain intended for harvest. The grazing cannot occur during the primary nesting season, which for Colorado is March 15 through July 15. In addition, grazing can only occur if the approved cover for that practice has been established and the grazing will not adversely impact the purpose or performance of the practice. All livestock shall be removed from CRP acreage no later than two months after incidental grazing begins. CRP participants utilizing incidental grazing will have a payment reduction for the acreage being grazed. Participants are also responsible, at their own expense, to reestablish a cover destroyed or damaged as a result of the incidental grazing. If the acreage to be grazed is separated from the surrounding cropland by a fence, the CRP acreage shall not be grazed. Producers should report crop acreage they intended to plant, but due to natural disaster, were prevented from planting. Prevented planting acreage must be reported on form CCC-576, Notice of Loss, no later than 15 calendar days after the final planting date as established by FSA and Risk Management Agency (RMA). Contact your local FSA office for a list of final planting dates by crop. Producers who suffered livestock feed or grazing losses due to recent wildfires could be eligible for assistance through the Emergency Assistance for Livestock, Honeybees, and Farm-Raised Fish Program (ELAP). ELAP provides emergency relief for losses due to feed or water shortages, disease, adverse weather, or other conditions, which are not adequately addressed by other disaster programs. ELAP covers physically damaged or destroyed livestock feed that was purchased or mechanically harvested forage or feedstuffs intended for use as feed for the producer's eligible livestock. In order to be considered eligible, harvested forage must be baled. Forage that is only cut, raked or windrowed is not eligible. Producers must submit a notice of loss to their local FSA office within 30 calendar days of when the loss is apparent. ELAP also covers up to 150 lost grazing days in instances when a producer has been forced to remove livestock from a grazing pasture due to wildfire. For beekeepers, ELAP covers beehive losses (the physical structure) in instances where the hive has been destroyed by a natural disaster including flooding, high winds, wildfire and tornadoes. Producers with a qualifying loss should contact their local county FSA office to file a notice of loss within 30 calendar days of when the loss is apparent. Producers should also maintain records and receipts documenting that livestock were removed from the grazing pasture due to wildfire, costs of transporting livestock feed to eligible livestock, receipts for equipment rental fees for hay lifts, feed purchase receipts and the number of gallons of water transported to livestock due to water shortages. For more information regarding ELAP, please visit www.fsa.usda.gov/disaster. April 2: Application for Payment deadline for the 2017 Livestock Indemnity Program (LIP). (A Notice of Loss must have been filed with the local FSA office within 30 calendar days from when the 2017 loss was apparent).